Welcome to the world of Dave Benson Phillips! 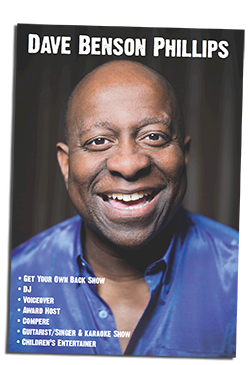 | BiogBiog - Welcome to the world of Dave Benson Phillips! It’s a sure fact that most children in the UK have enjoyed being entertained by Dave Benson Phillips who, over the last 28 years, has become one of the most popular children’s presenters on television. His big break into television came when he has working at Haven Holidays as a Children’s Uncle. He was spotted by the BBC and given the chance to appear in Playbus, which later became Playdays, a programme that ran successfully for 6 years. This led to Dave being given his own show by the BBC, the phenomenally popular BAFTA nominated Get Your Own Back, of which there have now been 14 series. He was given another major series in 1996, this time for ITV, called Disney’s Wake Up in The Wild Room, which was aired every Saturday morning for nearly two years. Dave is very well known for starring in the best selling Fun Song Factory video series, which was televised for ITV. He has also presented numerous other television programmes including the CITV series Petswap, co-presented by Fearne Cotton, Nick Jnr for Nickelodeon and Words and Pictures and Go For It for BBC Education. Dave is hugely well known for his work on the Disney Channel, presenting the children’s cookery programme Bitesize and as “Big Dave” on the Cable Guide Award winning, Playhouse Disney with co-presenter “Little Alex” Lovell. Dave has continued to perform to live audiences throughout his career, including touring with Get Your Own Back – Live! and The Dave Benson Phillips Show, plus one of his proudest moments, singing at the London Palladium as part of the Children’s Royal Variety Performance. In 1999, he made his first appearance in a musical, playing “Eddie Hair” in The Demon Headmaster, which toured throughout England. Throughout his hectic schedule Dave has always found time for children with special needs, amongst whom his Makaton sign language video is extremely popular. He also donates many hours to charity work both here and abroad. In 2008 Dave released two musical CDs, ‘Dave’s Are We There Yet!’ Album and ‘Dave’s Nap Attack Album!’. He has also been working on a new show for young children based on his Get Up and Go! stage show and DVD. He’s also had the incredible honour of being one of the support acts for the group, McFly at their Brighton concert! Hello! Please feel free to subscribe to my mailing list and be informed about latest news, events and updates.